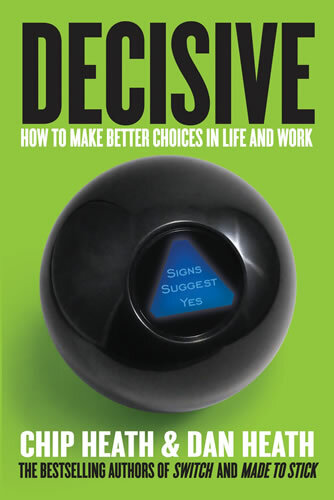 How good are people at making good decisions? Not very. 44% of lawyers wouldn’t recommend young people become lawyers. 83% of business mergers/acquisitions failed to create any value for shareholders. 40% of doctors “completely certain” of a diagnosis are wrong. Instead of trying to decide between two options (OR) can you combine them (AND)? In deciding between doing something (or not), consider opportunity cost (what could you do with the resources otherwise?). When presented with two (or more) options – imagine you can’t choose any of these. What else could you do (vanishing options test)? Can you (slightly) defer a decision by deciding to do “all options” (Multitracking) until you have enough real-world data? Shift your viewpoint alternatively between prevention (avoid bad) and promotion (achieve good). Look for dissenting opinions to better understand what you’re not naturally seeing. If you don’t have any dissension, beware! Deliberately test our assumptions. A mistaken assumption may be a large business opportunity. Compare our inside view of a situation with the “general statistics” for our type of situation. We think we can see what others can’t, but the numbers don’t generally lie. Shift between zooming in and zooming out. Create small experiments to test theories (“ooch”). People are bad at predicting the future. Instead of looking for giant leaps, test smaller steps (Instead of hiring an employee, can you hire them as a consultant for a try-out period?). Emotions sway our short-term perception. Consider vantage from 10 minutes/10 months/and 10 years into the future (10/10/10). What would we advise our best friend in this same situation? Agonizing feelings are a sign of a conflict in your core priorities (long term emotional values, goals, and aspirations). Ensure you act upon your core priorities (minimize lesser priorities). Instead of trying to paint a single image of a future, paint a range of images (worst- and best-case). To reduce the likelihood for worst-case, anticipate the problems (“What would it take for this to be true?”). Craft tripwires (automatic “wake-up calls”) to ensure clarity of decisions. Group decisions need to feel fair (“process”). Make sure everyone’s options are heard, repeated back, and enlarged. People regret what they didn’t do. Should you read this book? Make your own decision!